On many a Saturday afternoon, there is a gentle knock at the door, and my entire family knows that deliciousness waits on the other side. It is MrsWheelbarrow, toting a left over apple tart from a class she just taught, a stick of cured meat that none of us should be eating, or maybe some contraband cheese from France. She sits down at the table, gleefully unwraps her goodies, and politely ignores the dirty soccer cleats, the pile of coffee cups and the bowl of whatever I was mixing up for a bake sale perched precariously on a pile of newspapers nearby. Ours is a chaotic household, and MrsWheelbarrow brings a small spot of the ordered universe that is her kitchen to our home. It has been that way since literally the first day we moved here, 14 months ago, when MrsWheelbarrow, having yet to meet me in the non-virtual world, left a tomato plant and jars of her delicious preserves on our porch. Knowing I was bereft over the loss of my fall farmer’s markets in Los Angeles, she quickly gave me the D.C. tour. When it came time to plan a family event, she steered me to the perfect barbecue shack. In short, MrsWheelbarrow embodies goodness, and so, as anyone who has tried her recipes can attest, does her food. So recently, when I asked one of the technology guys at the office -- who did me a solid concerning an expensive type of telephonic equipment and water damage, ahem -- what type of cookies he liked, and he said peanut butter, I was thrilled to see that MrsWheelbarrow has posted one such recipe on the site. I will pause to say that I have made many of the peanut butter cookies on Food52, and I have enjoyed them all, largely because I feel peanut butter and sugar go together like Malibu and a surfboard. But All I Want For Christmas Peanut Butter Cookies are one-extra-step special, with the delirious-making addition of more sugar and more peanut butter in the form of frosting. I began where instructed, with a nice hunk of unsalted Plugrá, and commercial peanut butter. I then followed the instructions carefully, sifting up my dry ingredients as my butters and sugars mixed, and then adding the eggs and vanilla. I folded the dry ingredients into the wet by hand, to avoid over mixing. MrsWheelbarrow instructs you to make these cookies on the small side because they are so rich, but I was a bit heavy of the hand and made standard-sized guys. You should probably do as she says. I am not going to dwell on the part where I removed one sheet pan from the oven only to have it slip out of my hand, dumping peanut butter cookies into the oven hinge and all over the floor, and the screaming and yes maybe a little bit of crying that ensued. Because I moved on. While my remaining cookies cooled, I washed out my mixing bowl and went on to the sandwich cream, which is a sort of standard butter cream infused with the addition of a peanut butter and chocolate chip mess that will make your head explode. Frosting these guys was fun, and they look lovely, especially tucked into a paper box with some tissue paper, if they are a gift. Mr. Tech Man smiled politely as I handed them to him. I think maybe he thought he was getting a wrapped box of Nutter Butters? I waited a bit, because I knew what was coming. I knew just how he felt. Divine cookies are like a special friendship -- they find you when you don’t expect it, and maybe when you need it the most. I'm a sucker for a cookie with a good story. These are great. I did peanut butter filling in half of the cookies, and Nutella in the other half. Love them! I too would like to know the answer to the natural peanut butter question. I won't use processed peanut butters, so can I do anything to alter the natural stuff to make it work here? Add sugar maybe? I just made these tonight. I am wondering why the recipe writer tells not to use natural peanut butter. Any scientific reason behind it? These are indeed rich, I should have made them as cute mini cookies! Was I not supposed to use "baking" chocolate chips? Peanut butter anything was my mother's favorite. I am going to make these and I'll bet I can raise her from the dead. They look very, very good. Does MrsWheelbarow ever visit Vermont? These cookies sound heavenly, like MrsWheelbarrow. Click on the name of the recipe and you'll see the save button on the left of it. I'm saving this recipe to make on my next baking day. I still have two other recipes from this site to make first. These sound fabulous! Diabetic. Can't touch it. But I WILL make these and get them to a deserving friend before sundown. My mom can't cook and peanut butter from a jar IS the family recipe. Thanks! that's excellent. thanks for sharing that! Lovely article and delicious cookies. Jenny is lucky; I miss having having a cooking friend. I always look forward to your articles and I love when it's a recipe that I've missed somehow like this one! Thanks again! Did the new site design add a new "feature" that automatically links user profiles? Or did you hyperlink mrswheelbarrow five times? Now this is how to gild a lily. Lovely story. Lovely people. Are you sure that was your kitchen you were describing? It sounds very much like mine. While other aspects have been covered, and I agree -- I love the 2nd paragraph. Usually FOOD52 takes us to a serene place where we cook and bake like angels, but here's the reality check! Beautiful piece. Everyone should have a Mrs. Wheelbarrow in their lives. 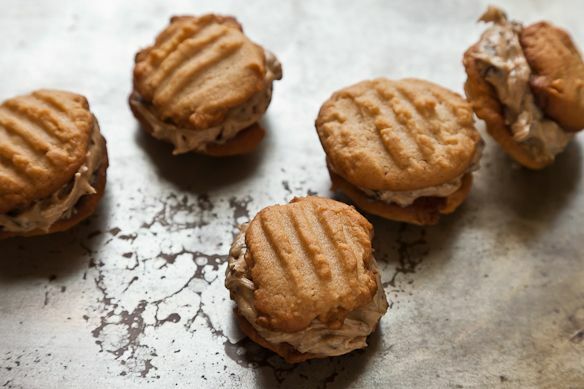 There is a bakery in SF that makes a double-decker PB cookie. It is my fave, but it is out of the way. These sound wondrous and will save me a trip. Thank you both! There's nothing like a gift of homemade goodness to make you feel welcome or appreciated. What lovely gestures on both your parts. I've had my eye on this recipe for a while, but I feel like ditching work and whipping up a batch right now. I just love every word of this piece, and envy the two of you and your Saturday mornings! ps curious as to what happens if you use natural peanut butter??? I agree. I used to be all virtuous with pb cookies, using only the natural stuff. The texture suffered, and peanutbuttery taste just wasn't there. I wish you were my neighbor, Mrs. W.
Great story. By coincidence, last night, driving home to DC from NYC, I had a most unsatisfactory peanut butter sandwich cookie from a diner. I couldn't get the experience out of my head and was vowing to figure out how to make a truly delicious peanut butter sandwich cookie. Now I don't have to look any farther - someone up there heard my call.